For those of you hoping to see some "in action" looks or screen caps of folks dancing to the Sprite Jam Cam at Philips Arena or some Kiss Cam "After Dark" footage---we do apologize for our misleading title. For those who watched the Hawks 100-89 win over the visiting Washington Wizards, you know exactly what we're talking about. There are games when everything clicks, folks are on the same page, and every choice that's made is the right one. This was not one of those games for the Birds. Sure, the Wizards never truly challenged after the Hawks spotted their guests a 15-5 lead, but with Antawn Jamison out, Caron Butler getting hurt and not playing the second half, Gilbert Arenas turning the ball over (7) times, and Flip Saunders deciding to play Nick Young and bury JaVale McGee until too late, the game was there for the Hawks to salt away long before all doubt was erased. It was reckless play by the home team that allowed the game to be even the margin that it was. After the Hawks climbed out of that temporary hole behind Jamal Crawford's excellent (15) point first half off the bench, the team dropped their sharp play for something more out-of-sync. The result was a number of missed opportunities on the break, poor shot selection by just about everyone on the floor, and a precipitous drop in offensive shooting percentage due to a high percentage of standing around in the third quarter. Joe Johnson couldn't get things to drop early, or middle, or late. And because the rest of the team was floundering as well (41 percent for the game after shooting around 47 percent for the first half), Joe began to force things and, as a result, sent the team further down the rathole in that third quarter, scoring only (17) points for the entirety. Even defensively the wheels began to come off as the Hawks' big men stopped moving their feet and began to slap at passing Wizards. Heck, Joe Smith even got whistled for fouling McGee---when he was shooting backwards. The saving grace for the Birds was at the foul line, where the Wizards couldn't make 'em and the Hawks couldn't miss. Atlanta shot a whopping (91) percent from the foul line (31-34) while Washington shot managed on (64) percent (14-22). The Hawks even made a dead ball free throw (gasp!). It wasn't as if they didn't want to or weren't trying, they struggled to get things in gear. In the fourth quarter, the guys would put together 30-40 seconds of good basketball every so often, just enough to keep the Wizards at arm's length. The grinding noise of the Hawks offense could be heard even with the Official HDTV of THHB muted. The best of these moments came just under five minutes to play when Josh Smith drove the basketball and dished to Al Horford who slammed it home then (16) seconds later, after Josh's 900th career blocked shot (an Arenas 3-attempt and his first block of the game), Mike Bibby lobbed a ball towards the basket, a pass so high that only Josh could corral it and complete the flush, which he did. Regarding Smith's 900th block--in doing so he became the fastest to reach that milestone, breaking Shaq's old record. Take that, Cleve-land! We've said it before, when Smith drives to the hoop we expect the ball to fall in--he has become one of the best in the league at finishing. Even with the Wizards tall, strong frontcourt and all the shot blockers, Smith found a way to finish. It's like a celestial compromise the basketball gods are making with the young man---just stop shooting jumpers and go to the hoop---and we promise we'll do all we can to guide it in---it's the score and one more! Maybe it was just us (likely), but when Josh picked up his fourth foul early in the third quarter, he looked foul heading to the bench, but not in the sulking, brooding way we may have seen in years past, but in a "aw, heyazz no" way that we noted Smith seemed irritated and that the Wizards may have done something to wake him up. That Smith had (9) points, (2) boards, and his only two blocked shots in the final quarter may not qualify as dominant, but he definitely made his presence felt in a way he hadn't during the other (3) quarters of the game. While The Backcourt struggled to shoot straight (8-25), they kept things going in the other stat columns (10 boards, 13 assists, 3 turnovers)--but it's a reminder that the Hawks can't rely on the jump shot to win games. The Hawks pulled away when they went to the rim and made things happen that way--- a big reason why they went to the line as much as they did. Al Horford drew back a little offensively tonight---as he tends to do against much larger defenders. He rushed a few shots around the basket and finished with a 4-11 night from the field. The one time he did take it strong in the first half was right at the end, when he got the ball in the block, turned toward the lane and put a hook in the hoop, sending the Hawks to a (14) point halftime lead. BTW, we've got inside information that Zaza Pachulia even looks for contact on the pre-game layup line. Oh, there were opportunities for Zaza to make a bucket (he was 0-1 with 4 made free throws), but he didn't have the slightest interest in all that nonsense---it's all about the whistle with Zaza, baby. Not Quite Yet, But Who Knows? We previewed the game tonight by noting the abundance of prognosticators that see the Wizards at least as the Hawks equal .We also stated that, while this game was a good litmus test for both teams, it's shouldn't be a "told you so" game either way. Afterwards we have to say it was a let down in that regard. With Jamison out, Butler getting hurt, and Flip Saunders obviously still getting to know his personnel, the Hawks could see a much different team the next time they host Washington on January 13th, rendering this game just another notch on the win or loss column, and little else. We don't know why, but if JaVale McGee was healthy enough to play (10) minutes, he should have played more. THHB is not a fan of the token starter (cough--Royal Ivey--cough), so we have to question why Fabricio Oberto not only started, but played more minutes than McGee--who seems to always be a thorn in the flesh of the Hawks. Between McGee and Andray Blatche, they were menaces to the Hawks society. And while we're at it, congrats to the Wizards to holding Mike Miller to (5) shots, in (32) minutes no less, while Nick Young saw fit to launch (8) in (12) minutes, which all missed. THHB sees glory in a 2-0 start, and looks forward to the upcoming 3am recaps during their upcoming West Coast swing. All caffeinated beverages should be routed quickly through the concierge in the Comments Area. This doesn't account for SI's own Basketball Preview selecting the Wizards as the 4th best team in the East, casting them above the Hawks or even our own panel of distinguished Hawks Bloggers mostly selecting the boys from the Cap as the team to watch in the East next season. We're excited to see if the Wizards are indeed back--as they contain the fabulous shooting of Mike Miller (Go Gator) and the Hawk Hating Gilbert Arenas. We remember (not so) fondly Arenas, bearing the Oakland colors a few seasons back, stealing an in-bounds pass in front of Dan Dickau (Dickau playing on the final possession! Good times!) and then racing down to win the game for the Warriors. Ah yes, Arenas is a player with whom anything and any shot is possible---or would that be was after the series of injuries that have made him more bystanding than outstanding recently. All of which makes tonight's game in Atlanta a decent early season matchup/litmus test to see where each franchise is. Have the Wizards indeed made up the considerable ground that existed between the two teams last season? Will the Hawks be just as strong as the season before with their improved bench? It's a low-impact assessment on where these two division mates reside. This game shouldn't be cast as a defining "see there?!" for either team, but a good barometer for the early season. For the Hawks, it's a chance to show that they are still the best of the eastern rest, and to play against a team that many think are on the same level as the Birds. We especially love Opening Night at home. The Atlanta Hawks gave us plenty to love about Opening Night at Philips Arena Wednesday night by kicking off the 2009-2010 season the same way they did it last season, by winning--this time casting aside the Indiana Pacers 120-109. The Hawks started slow, picked up steam by halftime, and then battled the Pacers into the fourth quarter where, as they have made it a pattern of doing so against lesser comp (especially at home), they put the guests away behind strong interior play and clutch shooting. The Pacers started the game shooting hot, and it helped them to a 53/56/84 night against the Hawks. They likely would have assumed a win if they had known before the game how they would shoot, as they also had the Hawks playing their tempo and their game, but the great equalizer was a massive (25) turnovers to the Hawks (10), allowing the Hawks to close the early gap and eventually overtake the game. Game One of the season puts some of the fluff of the off-season aside and begins to paint the mural that will become the regular season. In the beginning of a mural, anything is possible, and as the first game concluded THHB saw plenty for Bird watchers to smile about. Al Horford answered the bell by being very beastly all around against the slower Roy Hibbert and the less talented Jeff Foster. Horford scored (24) points by playing a very confident, powerful game. He shot without hesitation, he took the ball to the hoop without doubt, and finished with plenty of authority. He corralled (3) offensive rebounds, all of which seemed to lead to putback or tip dunks and owned the glass overall, finishing with a game high (16) rebounds. Defensively, in addition to collecting the boards, he contested shots without drawing fouls, blocking a pair to go with (4) assists on the offensive end, thereby filling out the stat sheet. Saying Al Horford set the tone might be stretching it too much, but in his game we saw the bigger picture of how the Hawks won; a consistent effort which, when the game concluded, showed its full value. Hawks fans also got to see the tuned-in Josh Smith in Game One. Smith was extremely aggressive on both ends against the Pacers, contesting shots, going after steals, and taking the ball to the hoop with extreme prejudice. Smith is becoming one of the best in the entire league at finishing around the hoop. No, not just on the dunks, of which there were some fantastic throw downs by Smith, but anytime he went to the basket, even when fouled, you felt confident it would go in---and it usually did. Smith took only (1) Ty Corbin Three all night long, and there were times where he was definitely tempted. For his efforts to delay gratification, he was rewarded with a 7-10 shooting night (0-0 on real threes) and drew enough attention with his interior scoring that he was able to distribute (8) assists on the night as well. This is what Smith can be when he is dialed into playing the game the right way---and is faced with a less than average defense. Joe Johnson took the game high scoring (25), but truth be known he captured the mark by launching a space shuttle shot to beat the shot clock with (6.5) seconds remaining in the game. Johnson definitely mirrored the early game struggles the Hawks had getting things flowing correctly, but once Joe was locked in, he lost the half court discomfort and had the typical ho-hum 25 points, 6 assist, 4 steal game we come to expect and dismiss from him. Game One also showed some of how Woodson may plan to deploy his bench and not use Mike Bibby so much. In what was not a settled game until the fourth quarter wound down, Bibby still logged just (30) minutes. He used that rest to make three big fourth quarter shots that gave the Hawks the lead and then put it out of reach. Two of the buckets were bombs that were standard issue open Bibby looks, but the 2-pointer sandwiched in between was a runner in the lane in which Bibby seemed to lose the handle on, but was able to sneak it by the taller players inside and get the bucket. That basket gave the Hawks a (4) point lead with 7 1/2 minutes left and the Hawks never trailed again. To be able to give that kind of rest meant that Woodson was already comfortable letting rookie Jeff Teague get his feet wet in his first official NBA game. Teague looked good in his debut, modeling a new take on the Josh Childress Memorial Jump Shot in going 2-7, but he seemed very comfortable at the point and was able to penetrate, dish, and get into the open floor enough to score (4) assists against (ZERO) turnovers. That his first game ended in a win and his first basket an impressive dunk were pretty tasty cherries on the winning sundae. For all the build up regarding Jamal Crawford as a Hawk and what it all means, he ended up playing a meager (11) minutes off the bench and his best shot of the night didn't even count. Crawford had (3) assists and a steal to go with his (3) points in such limited action, but his best action came when he missed a jump shot with about (4) seconds left in the first quarter and then, as the Pacers tried to throw the ball down the court to get a last second shot off, he leaped high to deflect the pass, collected the ball, and then turned against his body from about mid-court to try and beat the buzzer. The shot went in, but it was overturned in replay. For what it's worth, it looked like there was .2 seconds left when the lights came on, but it could have been un-synced on the telecast.Great shot anyway. Welcome to ATL, Jamal. Danny Granger was questionable health-wise before the game, but he was able to suit up and play (22) minutes for Indiana. This was probably helpful to the Hawks because when Granger was in the game he must have been wearing his Cloak of Invisibility, because he found himself wide open a bit too much for someone of his considerable talents. Granger cashed in (5) of (10) three point attempts in his short amount of time on the floor--scoring (31) points in all.If he had been able to go more tonight we might have had a more somber story to relate. Elsewhere, unlike in March where TJ Ford obliterated the Hawks guards for (29) points, Ford was unable to accomplish anything positive against the Hawks in this new season. Ford was 1-9 from the field and didn't find the job of scoring as easy as he did about (7) months ago. The reason? Quite a few times it was Joe Johnson handling the action on Ford. Case closed. It took exactly (3) seconds into the season for the Philips Arena clocks to go haywire. That in itself isn't funny, especially considering the the reputation the official scorers and the electronics have in the arena. What was funny was that, after the Hawks had won the tip and the game underway, the game had to stop--which frustrated the fans, most of whom we're guessing have seen this a time or two. Clearly annoyed, the ATL faithful booed lustily. Ahhh--good to be back, isn't it? THHB believes that winning is better than losing. Arguments to the contrary can be laughed at inside the Comments Area. The Bill Shanks Show was very kind to host THHB for a Hawks Preview this afternoon. You can listen to the interview (if you can stomach it) below (2 parts)! Good luck getting to the game (or to your TV) for opening night and Let's Go Hawks! We've tackled The Season and The Starters and now it's time for----the Rest of the Story. We've been asked about the new depth the Hawks have and we have stated that, while yes it's nice to see familiar names and seemingly competent folks holding down the Six through Ten, it doesn't exactly mean the Hawks have the bench of say the Magic and/or Celtics, who just so happen to be the teams the Hawks should be aiming to chase down this season. They Liked it So Much, They Bought the Company! Making a summer long story shorter---the Hawks got great production out of Ronald "Flip" Murray last season, but it was only the third such season in RFM's well traveled career, making it very unlikely that he would repeat such production. The Hawks understood the value that RFM provided the team and figured they needed to ensure such levels of production needed to be secured for this follow up season. The Hawks also entered the offseason without a signature of Mike Bibby's on a contract meaning that, should Bibby sign elsewhere, they could have been without a triggerman for their perimeter heavy offense. Enter the deal for Jamal Crawford---a deal that fulfilled both insurance in case Bibby bolted and also a player who could likely match that production that RFM lent to last season's team. Crawford's career numbers are, even on the low side, right at or above the season that RFM provided--so they have that going for them, which is nice. The cost of attaining such assurance, player-wise was insignificant: a finished Speedy Claxton and the disappointing/disliked (by Coach Woodson standards) Acie Law. The price tag (2 more years, 19 more million dollars), however, is what has raised some eyebrows around the Nest, given that with that contract the Hawks, even if Joe Johnson left this coming offseason, wouldn't have enough for a star level contract to replace him. The question this season around this shall be: Was it worth that kind of commitment to hedge a Bibby bet and/or replace RFM (circa 2008-09)? Crawford provides a terrific ability to score--so much so that he scared THHB every time he made a shot when he played against the Hawks, as if he was going to go nuclear and go on one of those runs that can paralyze an opponent. His defense had been much maligned everywhere he has gone, but none of those teams have seen the level of bad the Hawks have individually displayed on defense over the years--believe us America when we say: We can cope with it. We were very surprised that Zaza Pachulia took (4) years and (19) million dollars to resign with the Hawks. That the Cavaliers spent quite a bit more for a similar player in Anderson Varejao (6 and 50) and Marcin Gortat receiving a full MLE from the Magic should let Hawks fans know how much Zaza wanted to be a Hawk. Every winning team seems to have a player like Zaza coming off the bench in the frontcourt. He doesn't really have the ability to block a shot (no seriously, don't wait for any blocks unless Earl Boykins is driving and even then--he's more likely to get knocked down by Zaza than get his stuff thrown out of there.) and he won't be confused with Brad Miller in terms of passing the ball from the center position. But what he does--oh, he does so well. He provides precious extra possessions by his ability to offensively rebound. (Zaza was 7th in ORB% among players that played at least 15 mpg last season (basketball reference is king) ). He goes to the basket with reckless abandon---not with the intention of scoring necessarily, but with the intention of his version of a meet-and-greet in the lane, otherwise known as drawing contact. Pachulia's draw foul rate was far and away the best on the Hawks at (25.2) percent (82games.com is also king--remember--we're appeasers!). He is also the type of annoying presence for the opposition that makes you love that he is on your team. THHB doesn't believe that he is insidious as some other goons might have been on other teams in the past---Zaza brings the nice guy demeanor to the "Screw You Guy" for the opposition to shout at. He was their big outside the roster free agent signing, and they got him for peanuts. THHB hopes it doesn't end up smelling like elephants. Smith will provide a more seasoned upgrade for the minutes Solomon Jones logged last year, and if you were certain that Smith would be used more than Jones, then you're saying that he'll thief those minutes from Zaza, Al, or Josh---try that at your own (and the team's) risk. Smith's playoff seasoning is really encompassed in the last (2) seasons he spent in Cleve-land. Smith provided the same sort of minutes we feel Woody will use Joe for here---a dependable big body off the bench, rather than the "I'm not ready" look that Jones often provided or the cavalcade of projects and D-leaguers the Hawks gave floor time to. We would have preferred a more impact type role player, like say Drew Gooden, but if the goal was to upgrade the minutes from last season and replace one for one, then Smith (especially for the min price) was a good option. We would just caution not to expect much at all from this role. Jeff Teague is fast. Maybe the fastest Hawk with the basketball since JT. What Teague does not have that Terry had like crazy is a drop dead jump shot. And in the Hawks stand, dribble, and shoot offense, that may not be such a good fit. Teague has a nice feel for the ball and delivers it surprisingly well for a guy not even into the seasonal part of his rookie year, but to make the most out of his skill, the Hawks would have to allow him to penetrate and dish or get out on the break and run. Filling the "Mike Bibby" role in the offense does not play to Teague's strengths and would make for some frustrating outings for the young man. Teague replaces Acie Law as the PG of the Future Du Jour--with an important advantage. Leading up to and through the draft, Hawks GM Rick Sund made it clear that Mike Woodson would have a good part in making this pick. Even on the night of the draft, there was Woodson in the war room, and afterwards Sund made it clear that this was a "team" pick, leaving Woody's fingerprints on the 19th pick. It behooves Woody to not bury Teague on the bench or make him play away from what he does best, so that may end up in the Hawks favor when it comes to the eventual production of this exciting young player. We never believed that Maurice Evans could replace the production of Josh Childress and the stats say it wasn't even close. Evans struggled through massive stretches of play with his outside shot, making the series of games he was hot moot by impact. The offensive rebounding and overall efficiency provided by Childress was missed off the bench and in the spots where Evans was forced to start (25 games last season). Evans did however prove to be quite a leader and a steady voice of reason, but his play on the court was a little too shaky for a guy who logged over (1800) minutes for a playoff team. Others Finished with (65) Percent of the Vote and Will Take Office in February. Randolph Morris, Othello Hunter, and Jason Collins make up the rest of the roster, making the Hawks one of (4) teams to carry the league minimum of (13) players. Morris is in the last year of a (2) year, minimum level contract and hasn't shown near enough to justify continuing the experiment to this point. He plays smaller than his height, but does have soft hands--it just doesn't amount to a lot on the basketball court at this point. Hunter is an aggressive, always improving big man who wouldn't be so bad as the Hawks 5th big man, but that role has been given away to a Proven Veteran. Hunter still is very raw, but gives fans what they are looking for from a player so far down on a bench---hustle, aggressiveness, and obvious athleticism. Collins is the Proven Veteran who will no doubt get the call if Al, Zaza, Josh, and Joe Smith are unable to return to the game. Collins once was an excellent defender but in recent years seems to have lost the fastball. We are interested to see what the big fella (and he does have some serious NBA size) can provide if pressed into duty, but we're getting the feeling that we don't wanna know. To summarize: The Bench has improved, but one did not have to elevate to the levels of The Namesake to clear the bar set by the previous season's benches. They're OK, and that is definitely an improvement. We Watched (27) Minutes of Previews---When Does The Movie Start?! We've said our peace, now we're ready for the home team to prove us wrong (unbloody likely with our talented scouts and mathematicians on staff here). GameTime is Tomorrow Night---A Home game even! THHB will appear on The Bill Shanks Show this (Wednesday) afternoon @ 5pm EST (click the link for the live stream if you want to listen in) to talk about the season, players, and all other things Hawks. In other words, just what you have read for the last three days---but in audio form! Seriously, tune in to Bill's show as he actually hosts a show in Georgia that gives a darn about the Hawks and will talk knowledgeably about them . THHB is amped for the new season. That is all. After being accused of being a Premiere SourPuss over at Peachtree Hoops yesterday, we turn to the more light hearted assessment section of the Season Preview, a quick look at the five (likely) starters for the Birds in 2009-2010. Al Horford is a Gator...and this one fact buys plenty of good will when it comes to reviewing, watching, explaining, or anything to do with his game. We love his enthusiasm, athleticism, and all of his intangibles. He is a very good rebounder and has good timing on shot blocks. He can run the floor better than any center in the East and finishes with what the children in THHB's neighborhood call "authority." He flexes muscles, he shouts at perennial all-stars, and he does all the little things (if you call setting proper picks, moving without the ball offensively, etc. "little") that any club would want a Top 3 pick to crave doing. We have long pointed our itchy trigger finger at the offensive philosophies of Coach Woodson as a reason for Horford's relative absence on the offensive end. At Florida, he showed he can score from the post---In Atlanta, we've seen bits and pieces of that, but his two seasons with the club, one has to classify such events as "cameos." We've argued that he has been relegated to nothing more than a clean-up-on-aisle-seven fellow in Woody's eyes and therefore has been stunted in his growth as an NBA big man, especially given his offensive gifts. But, as our Ebenezer Scrooge like Season Preview pointed out, this is unlikely to change. The post is a gimmick in Woodson's perimeter friendly offense, so this is probably an area that will not improve. Horford has little control over this, but we believe that there are places he can make further impact on the offensive end. Horford sometimes wallflowers on the offensive end, taking his subservient role a little too literally. Horford needs to play with abandon on offense, since it's less likely he would pick up a foul on that end. If he can shed his reserved approach, he can make a serious impact by going stronger to the basket from the post and also not trying to sneak the ball into the hoop, rather, making anybody pay for attempting to distract the ball from going through the rim. We feel we haven't seen the cut-loose Horford yet, the kind of animal that snuck out against the Celtics two seasons ago in the playoffs and then again against the Bulls very early on in last season. The goal for Al Horford should be to make his presence felt every night he steps on the floor. There were too many games last season where he was just another solid guy---this season needs to be 82+ games of passionate fire on the court from The Godfather. What Are You Waiting For? Dazzle Me! In most statistical simulations, there comes a time where potential ceiling for a player's career become par with where he is currently. This usually doesn't occur until someone has played a few seasons in the league and established his baseline. This might be the last season to push that ceiling up before the baseline is set for Josh Smith. Sure, there can be tweaks--such as the chatter about eliminating those pesky jump shots, but it's unlikely that Smith will somehow become all-world, or even all-star. We've been waiting to see what he can become---and we may have already seen it. Now, before that comes across as completely negative, let's add this. What Josh Smith is on nights where he is on it he is a force that can be a steadying as any other on the team. His aggressiveness in regards to deterring shots inside can instantly trigger a break---one in which Smith, with his outstanding speed and ability, can be both initiator and finisher. Offensively last season we saw a player blooming in his ability to finish in a half court set by taking the ball from the wings, head into the lane, and then either draw a foul or finish with a graceful touch around the rim. Those are the good nights. There are also the bad nights when Smith seems content to stand on certain spots on the floor---as if they had NBA JAM like different point totals underneath where he resided---and launch from the first pass that hits his hands, regardless of whether he could have driven towards the hoop to score in his much more efficient way. It's on those nights defensively where he isn't anywhere to be found inside. Those nights he is erratically jumping passing lanes and leaving the team 4 on 5 until or if Josh gets back into "position." On those nights Smith is a major liability to the Hawks and as the "4" on the team heavily contributes to the Hawks deficiencies on the glass. THHB feels this is it for Smith. We've long said we wouldn't deal him in a perceived equal value deal, because what he does few can do--and you can't just deal those guys William Nilly. What must be done is to heavily invest in Smith on the nights he has it--and manage his minutes when he doesn't to seem to be locked in. Here's hoping for a higher ceiling. Nobody had a more drastic improvement last season than Marvin Williams. He did it statistically, mentally, and he did so while winning over the fan base with his effort. No moment in the season was more telling than when Marvin returned to the court after missing a few injury plagued weeks. The standing ovation that came was a tribute to what Williams had shown and accomplished in less than a season and what he had become to Bird Watchers. He made big threes in games--heck, he made threes. He rebounded, ran the floor, got to the line, made his customary mid range shot---he looked like he belonged on the court consistently for the first season in his young career. The Hawks need him to continue his journey, as his position on the floor requires someone of his skill sets to man. While the won/loss record was alright while he was out, his production and activity on the floor was sorely missed--and understanding that led to the ovation when he returned. All of that plus his Rubik's Cube abilities, his dumpy walk, and of course, his stunning, all-powerful mustache add up to one of THHB's all-time favorite Hawks and we can't wait to see him back in action. There are games when The Backcourt gets hot from outside and flattens an opponent's resolve. In last season's 3-pt revival, Mike Bibby and Joe Johnson were reverends in the Church of the Long Shot. The Hawks offense is built around the capability of both guards to score, and Bibby and Johnson do little to shy away from accepting that particular challenge. Really? Thirty-One Years Old? That's All? No player makes things more difficult strategically for the Hawks than Mike Bibby. Play him and the defense has to pull together to cover and loses any margin for error given his lack of defensive ability (not effort, ability). Take him out and the Hawks offense loses a prime integral weapon that it needs to succeed; a cold sniper who will make teams pay for leaving him alone. Bibby also tosses one of the best rim-lobs in the game---and given Smith and Horford's abilities to finish such passes, they make for pretty tasty plays. There's talk about limiting the number of minutes Mike plays throughout the season, but it will largely depend on how both Jamal Crawford and Jeff Teague pick up the slack when he sits. THHB guesses there is a reason why the Hawks felt it necessary to lock him down for (3) more seasons---when you finally get your triggerman for your offense, you ride him until he rides out into the sunset. Miscast as a star, but not as an all-in-one workhorse--Joe Johnson can do anything on the basketball court short of playing all five positions at the same time. It's not the minutes per game that trouble THHB most (although we frown upon it), it's the type of minutes he has to play. Johnson routinely matches up on the toughest defensive assignment, then takes the ball on offense and, in a lot of games, grinds out the production needed on that end. It might say (40) minutes in the box score, but it's (125) in Joe Minutes. If he were a running back in the NFL, he would be getting 40 carries a game. The Hawks have to find ways to distribute the workload to others to get the most efficient play they can from Joe. THHB hopes that fans enjoy watching Joe, because he is one of the special players to have worn the Hawks uniform. His late game heroics, his killer sauce, ungodly range, and his give me the ball mentality at any point in the game, and ultimately his production has to be acknowledged and admired. He is in the last year of his contract and who knows---maybe he will choose to take on a different role with another team next season after wearing the badge of Best Player on the Hawks since his arrival. If so, take a long look this season---what he gives is a lot harder to replace than you might think. We already pitched in a few bucks to try and get Marvin Williams on Dancing With The Stars, so contributing to Joe's new contract is out of the question. THHB continues the Season Preview with Part Three: The Bench on Wednesday. Finally. We can see it. The lights, the glamour, the fireworks, and the residual smoke filled arena at tip off. It's time for the regular season. The 12th man has had their time in the publicity sun, but the now is to focus on the guys who will play and more about what we think is in store for the club in the 2009-2010 season. Josh Smith and His Many Ways to Confound, Frustrate, and Entertain (and produce). Constant slow starts at the beginning of games as the Hawks would try to take the other team's basketball temperature to see how hard they would have to play for that night. This would be commonly referred to by the team themselves as "coming out flat". 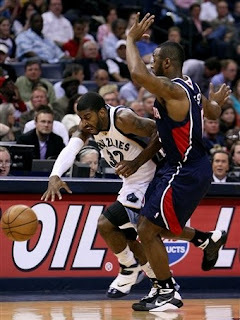 Offensive game plans that amounted to little more than dribble down, make a pass, and then stand around and watch that chosen player break his man down one-on-one and see what happens. At the end of games, this would be referred to as "Watching Joe Johnson". Poor defensive efforts that would start with Mike Bibby struggling to maintain his man or, worse still, constant switching that would create whatever matchup the other team wanted to see. It's no Rubik's Cube when everybody knows how to solve that little mystery. The Atlanta Hawks feature a talented young roster that on some nights can out-athleticize and out-shoot most teams in the NBA. This works against less talented teams in the league, but it doesn't scale to good teams, or on the road, and certainly not when both those factors are in play. The Hawks made a lot of headlines in the off season by fully accomplishing their own “To Do” list. Last season the Hawks grabbed home court advantage by beating the lesser teams in the conference, but stalled significantly when it came to the better teams in the East (read: better defenses, too), mustering only a 2-10 record against the Celtics, Magic, and Cavaliers. Part of the problem was a dependence on isolation and 1 on 1 offensive basketball, often leaving them too late in the shot clock to get good shots. It worked out against teams that struggled defensively, but was a prominent issue against the good teams who don’t have a problem holding down half court D for 24 seconds. Another regular issue for the Hawks is defensive rebounding, where the Hawks again finished in the second half in the league in the category. Bringing in Crawford and Teague highlighted that the team is alright with the strategy offensively, as both players fit that dribble and shoot motif. But, the additions of Joe Smith and Jason Collins, do little to address the rebounding needs. Essentially, the Hawks have decided to double down on last year’s strategy and success, leaving THHB to believe it will be more of the same in 2009-2010: A talented team that will achieve similar win column success, but will do little to raise itself to the next level. That was a little over a month ago. Since then, THHB has had time to get away from the think tank, the war room brainstorming arena, and various other rooms of the office and let the past season and subsequent offseason breathe with the intent to gather again, discuss things anew, and mark fresh opinions and bring forth perhaps a change of heart regarding the outlook of this season's Hawks. And, of course, the proof that the Hawks were serious about improving their bench--no, not a link to the Joe Smith signing, but the last days of Flubber West (for now). So now--armed with a month's worth of optimism and momentum, would THHB be able to see around their earlier summation and deliver a flowery preview of what's to come? The Hawks are what they want to be: A talented, quick team that will do very well against those who they can out-talent to win games and struggle against the teams that are truly worthy of championship consideration. We partially come to this conclusion based on the truth (our truth, we admit) that the Hawks approach to the offensive end of the floor cannot pass muster against solid defensive teams---the types of teams you see in, oh, you know, the higher rounds of the playoffs. It came as no surprise to us to watch the Hawks final preseasonal effort in Orlando--a game which does not in itself condemn the franchise, rather confirms it. The team looked the same as it ever did the season before, with new players playing the parts of those who are no more--which was Jamal Crawford for RFM and Jeff Teague for Acie Law. They stayed on the outside offensively, couldn't get shots to fall, got drilled on the inside and outside on the defensive end, and showed little fight or energy while doing it. In short, it looked like a reprise of the games the Hawks played against the Elite of the East last season. Yes, it was a preseason game, but one in which it was clear both teams were trying as if regular season--at least until it was out of hand. And we aren't the only ones who thought so..
Why should we have expected anything different? The coaching staff did not change, so why guess that the philosophy of isolation and up top hand-offs would differ? This team will dribble-dribble-dribble-pass-shoot more often than not, and due to their advanced talent level will be able to overcome lesser teams, but the teams that matter--the teams they will face once they make the playoffs--will be set defensively and grateful that the Hawks have made their jobs considerably easier by holding the basketball in a single space on the floor as long as they do. That the front office doubled down on the status quo with their moves in the off-season while not extending the chief architect's (Mike Woodson's deal ends at the end of this season) contract was telling in that they believe they have the talent to win big, but not sure about the basketball philosophy that's wrapped around it. You can't expect a different paradigm from the same people--that's why organizations make changes even while winning. If this style doesn't scale up again this year, THHB would expect a change in approach before the next season begins. Defensively, the Hawks have yet to address their most glaring need over the off-season---the need to defend the glass. As the Hawks plucked a considered upgrade to their backup PG position (Teague v.Law), they passed on a player that could have helped them in this perennially problematic area (Dejuan Blair). In the free agency period, they signed their own, traded for a reasonably sure bet to repeat RFM's input from last season (since RFM himself was unlikely to), and brought in more seasoned front court players (Joe Smith, Jason Collins) who add experience, but not that which will impact change for this season on the glass. Also, as Mike Bibby will continue to be a liability on the defensive end, they will either play Bibby less, which could impact the offensive efficiency even more, or hope for Josh Smith to be a larger presence in deterring shots inside when teams inevitably take advantage. Should Smith take more chances defensively to that end, the Hawks must be better at rotating defensively, lest they be even worse on the glass and give up more second chance baskets. This could certainly fall under the category of wishful thinking. Why so glum, chum? Well, re-read those last few paragraphs---and tell us to start dreaming of conference finals. Oh, we'll enjoy the season that is (we promise! ), as it will likely be filled with wins and great plays by a team with great talent. But we're not under the illusion that we'll be taking "The Next Step" under the same flawed basketball premises. Now, as far as actual win totals guesses go, we're not good at predicting wins, else we would be practicing a different vocation. But given the relative shakiness of the health of the team last season, and the talent that lay still within, it makes sense to us that the Hawks should be able to attain the same amount of wins that Pythagoras deemed the Hawks worthy last season (46), even if other teams have stepped their rosters up as well. From a Hawks historian angle, this is a good thing---consecutive winning seasons and relevance in the NBA are items that should be on every fan's checklist. They will on the majority of nights be the better team and perform as such, but will lack the fundamental basketball strength to push past the better teams consistently. If you have watched the team since the beginning of this decade, these are not things upon which to sneer---but if you have a desire to see more from the team you love, you should be braced for disappointment. Hey, at least they'll mostly do it in HD. Official THHB Record Prediction: Playoff Bound Atlanta Hawks, 46-36. As THHB waded back into the Atlanta Hawks pool, less than a week before they start counting "wins" and "losses", we cynically thought we knew what to expect---more of the same from last year. Sure, we don't officially come out with our Season Preview (patent pending) until Monday, but suffice to say we have said all offseason that the Hawks did little to change their approach to the league and their team in order to move up in the ranks of the NBA. Now, we understand that the preseason is much like ping pong games as a kid---nobody ever really keeps track of those records (123-67 lifetime over here--but we feel our cousin was using a loaded paddle for half of those losses). Still, we gathered to survey what had become of the young boys throughout a successful preseason docket--and how they would look against the defending Eastern Conference Champs, the Orlando Magic. We'll hold some judgment until the season actually starts, but with the Magic playing for reals, and even w/o Rashard Lewis, they clamped down hard on the Hawks 123-86 Friday night in Orlando, reminiscent of similar defeats levied to Atlanta during the previous season. The beating was one part luck---the Hawks had some open looks, but couldn't hit, while the Magic (including Stuff the Magic Dragon, it seemed) hit everything, shooting (61) percent for the night while the Birds could only muster (38) (actually .375, but we're feeling generous--whoohoo!) --and the other two parts were assault with many deadly weapons. The Magic took to aggressive play early on, led by Ryan Anderson (who Hubie Brown affectionately called Kevin for a while before Mike Breen "casually" mentioned Anderson's actual name in a different conversation to give Hubie a subtle hint. ), who scored (14) of his (18) in the game's first (7) minutes on a coffee-house blend of three point shots and aggressive (and effective) drives to the basket. We didn't look to review the deal that brought Anderson to Orlando with Hawk Hater Vince Carter, but we're pretty sure that the fans of New Jersey know they got robbed. And by robbed, we mean smoked. But hey, we hear Tony Battie is a fine fellow. Carter did his usual Hawk Stomp, including a nifty double clutch jam in the first half, when the Magic scored (62) points. He joined Dwight Howard in the "They Can't Guard Me" Club, combining to go 18-20 with the big fella. Howard enjoyed the usual non-matchup with Horford, who by now looks like Tiny Archibald to Howard's monolithic frame (μονόλιθος monolithos to our Josh Childress fans). But the fun really began when Randolph Morris matched up with Howard. Nothing much has changed as Howard relished taking it hard to his former AAU teammate over and over, including another thunderous dunk which caused Morris to be dwarfed by Howard physical presence. And Morris was still not smiling. As for the Hawks they struggled throughout the night to make any shots: layups, mid range, and of course the jump shot. You could chalk it up to shots not falling, but they never seemed to against the best teams last year, either. For those who reveled in the delight of Josh Smith's epiphany regarding jump shooting throughout the preseason, this was not a good night to bring visitors to the revival--as even though the young Smith made a couple of those shots, alas, he did take them, including a Ty Corbin three. We will definitely hold off on labeling Jeff Teague, but in ignoring an Ugh-for-Fifteen night, and factoring in his rookieness, the slight first rounder registered as a faster, leaner upgrade over Acie Law. He had a nice feel with the ball and passed well, but his outside shot was not good, and considering the coach and offense he plays in, that does not compute to good fit for his first season. Tune in Monday for THHB's Season Preview to find out what it means----or you can read all over the lines above to get the glimpse of what we feel will be to come for the Birds. Or do neither--that's also THHB approved (we're appeasers!). As far as this game goes, all it showed was that the Magic can still hit a lot of outside shots, and the Hawks still can't stop them. We had to go back into the great statistics at Basketball Reference to fact check Hubie Brown's assertion that Jason Williams (he of the Gator lineage) is a good, responsible decision maker in the open court. We had to rewind (3) times to make sure he said just that and then it was off to the statistics lab where we discovered that, indeed, Williams had tuned down the Wild-Child-Style from his early days to develop a more serene court sense. Go figure. THHB takes a tip of the Jason Terry Memorial Hat to Williams, who returns to the league and increases the NBA Gator Nation by (1) in doing so. Williams was Billy Donovan's first big name landed at Florida and we thank him for his single season of fun there. Welcome back, crazy. It's Mario West doing what he did best. Because he has spent the last two seasons with the Hawks as the most limited of defensive specialists, usually being called upon by Mike Woodson to play the final possession of a quarter/game, he has averaged just 4.6 minutes per game. Amongst players with at least 100 games, that is the lowest career minutes average since Paul Noel, who played for New York and Rochester from 1948 through 1952 in the BAA and the NBA. A couple of guys have come close, but no one else has averaged fewer than five minutes in an appreciable career since the 1950s. While interesting, this does not exactly bode well for West's future. Indeed it did not bode well as West joined Garrett Siler and Courtney Sims as former "Hawks" thereby making the Hawks roster complete as we near the beginning of the real season. We're not mean or personal here at THHB, but we are compelled to be honest. There was nary a single time we anticipated West's presence in a game versus plenty of shudders. The days of playing 4 on 5 as a tradeoff for West's "enthusiasm" wasn't a good one in our admittedly completely amateurish eyes. But now that he is gone (for now, at least), West must be complimented in that he played (2) full seasons in the NBA, a great feat unto itself. Even greater must the accomplishment be recognized when you consider that West's only discernible NBA talent was his hustle and aggression. That a player can make it that long on that little speaks Swamp-like volumes to West's work ethic and commitment to being on the Hawks (and in the NBA). Kudos to you, dear sir---your career will long be noted here at THHB. THHB will be releasing their Season Preview next Monday, October 26th. Efforts to stop said publication should be considered fruitless, but we understand all the efforts. The Mario West support group weekly meeting has been postponed until further notice. Folks, the wait of the preseason is like the undertow at the beach (that's the place where the oceans rises to meet the land in such far away places such as New Smyrna Beach--a mere half hour from THHB HQ) for those of you helplessly landlocked as we enter the chilly season. The games and the action of not-quite-yet-real basketball pulls you into the anticipation of what is referred to as "real basketball"---and the closer the start date gets, the more you feel the pull. Then, as in a mere week from now, it happens. The overflow of the the opening night of the NBA washes over those of us who are still excited to see it. What happens at such a point for the good guys, those known as the Atlanta Hawks will be made a bit clearer. We're not going to disclose what we believe---that's fodder for an entire entry unto itself (hint: next Monday is a decent enough timing place to drop such irrelevant forecasting)---but suffice to say that, like in the previous download of memories---we've been fooled before by eliminating the talent-absent opposition competing in the preseason. So--fool us once, Theo Ratliff, shame on you---fool us twice...etc. We will be in full effect for the titanic tilt of the "Orlando Magic" and "Atlanta Hawks" on the 23rd (on ESPN!) and have the season preview ready to roll as we launch THHB coverage of the 2009-2010 season next Monday. We're getting back to business at THHB, and much like the team we cover, the preseason---she don't mean so much. So we're going to take it easy, work on our form and get back into game shape in time for the regular season. Beware the preseason excitement and stories. Much is said round these parts about the lack of actual basketball like substance in these preseason games---but that hasn't stopped us from giving glowing reports about the team in year's past as we have gotten wrapped up in the excitement of seeing the good guys back on the court again. And, as if we didn't get enough with Henderson, we did the same for Chris Crawford in 2003-04, after (2) lost seasons due to injury. (He did not stay healthy the whole year, but did play a career high 56 games that year!). We even once declared the league wasn't ready for the up and coming Hawks, who were surely going to catch the league off-guard with it's amazing young talent. Was this 2007-2008? Not so much. It was 2001-2002 and the Hawks won (33) games. Guess the league was ready. The Lesson, of course, is that the early part of this decade was rather stinky for Hawks watchers, and we were willing to see silver lining everywhere, even when the lining was often aluminum. About a .001 out of 10 on the Shock-o-Meter--still, it's good to say that Our Favorite Gator will be a Hawk at least a season longer. Whooo. Hoooo. It has been announced that, Fox Sports South and Just Plain Sports South that 2/3 of the Hawks regular season games will be televised is Glorious High-Definition. THHB High Definition Viewing Center will be well used and the office fridge will be well stocked. Now, here's hoping the other 1/3 doesn't take two or three more seasons to join the crowd. THHB wishes an extremely fond farewell to Hawks Web Maestro Micah Hart, who later this week will be former Hawks Web Maestro as he moves on over to NBA.com to further his career. Since the 2004-2005 season, Micah has made the Hawks website a fantastic place for any fan to go for all kinds of multimedia information and has lovingly embraced the modest, yet enthusiastic Hawks Blogging Universe. The Hawks.com site was bland before Hart infused it with interviews, podcasts, and loads of insight and information by way of the news links, game reports, and ultimately his blog on the site. We wish Micah more than well---as Hawks fans, all of us at THHB owe a huge debt to a hours of free entertainment and information about our favorite team. THHB offices are done being fumigated and cleansed from all sorts of pandemics, epidemics, and academics. Directions back to the Hawks Universe can be left in the Comments Area or over on Twitter.